Armadillos belong to the same family of mammals as the sloth and anteaters. Their body is made of a leathery material generally referred to as “armor”. The species most present in North America is the Nine-banded armadillo who can be found throughout the entire southwest and southeast. 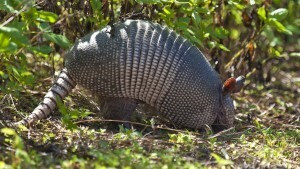 In fact, this species of armadillo is migrating ever further from Texas – the original state it was first found. In some states, they have established themselves after being released intentionally but in others, they’ve migrated naturally and been able to find adequate habitat for their survival. Armadillos love to nest in rock piles, around trees or deep in thick shrubs. Around structures they like to dig out dens under cement slabs. Their burrows are usually 15 to 25 feet long and cause extreme damage to tree roots. In many cases, this damage leads to the tree dying. These same burrows can lead to flooding when dug around a structure spaces and undermine patio slabs or walk ways. This weakening ultimately leads to the concrete falling apart and breaking. Armadillos are strong diggers and rely on this strength for finding food and creating shelter. Armadillos are attracted to tasty fruit which may be found in a garden or compost pile. Once they start coming around, expect them to return every night as they are mostly nocturnal. They like to establish “runs” where they will travel every night expecting to find food. These same “runs” can be used against them and will be discussed later in the article. Armadillos also love grubs turf worms. Lawns which are left untended will often develop beetle grub populations which will certainly attract armadillos from far and wide. Earthworms are another food source they like and either grubs or worms can be found by digging up sod, raking away leaves, moving carefully laid wood chips or bark, or simply digging frantically until such food is found. Either way, the mess they leave is typically aggravating, damaging and never ending. Armadillos mate in the fall and have their young around February or March. Almost every litter will have identical quadruplets. These miniature adults are ready to walk, swim and behave much like their parents. By the end of the summer, they too will be wreaking havoc in the neighborhood if allowed to keep growing their local numbers. Armadillo control can be accomplished by either a passive or aggressive method. Using both tactics will ultimately provide the best results. 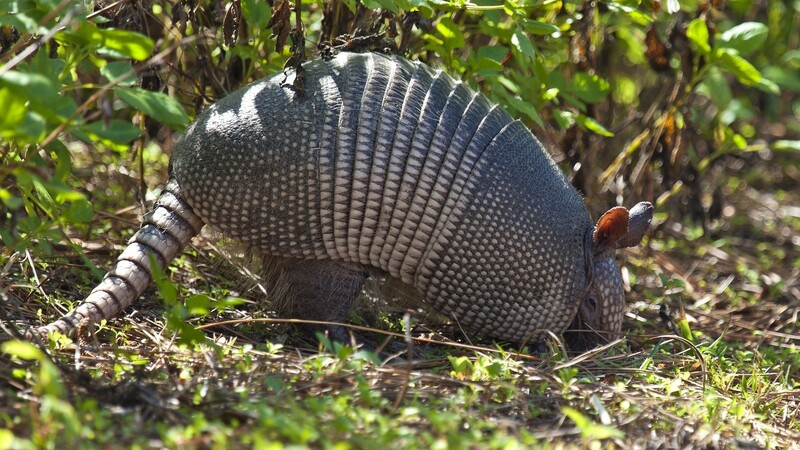 Passive techniques employ repellents and sprays to deal with the armadillos vast food sources. This approach will provide immediate results and in some cases, resolve the conflict. Aggressive techniques involve either live trapping or kill trapping and they too will provide instant control. However, if some of the passive techniques are not employed, other armadillos are likely to find the vacant territory once the current armadillo is removed. In most cases, both passive and aggressive armadillo control will yield the best results. There is a couple of repellent treatments for armadillo we’ve found to be effective. The first one is designed to repel them off the lawn, mulch, flower beds and basically any turf where you know they use to forage. 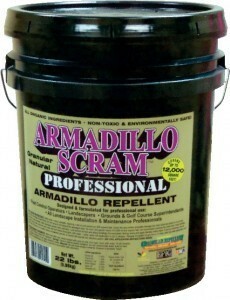 Made with all natural ingredients, ARMADILLO REPELLENT GRANULES are so concentrated that they set off an instinctive “alarm” inside the foraging animal that makes them become wary and unsettled. This in turn causes them to stay off treated turf and in turn, find new areas to forage. Apply the granules at the rate of 1 lb per 625 sq/ft. Ideally treating a 20 foot wide band around your property borders will keep them from entering. Typical treatments will last at least 30 days but for areas in the yard where they’re digging, renew the application every 14 days. Another more permanent solution is to install ULTRA SOUND REPELLERS. These devices send out sound which is distressing to a variety of animals depending on the setting. 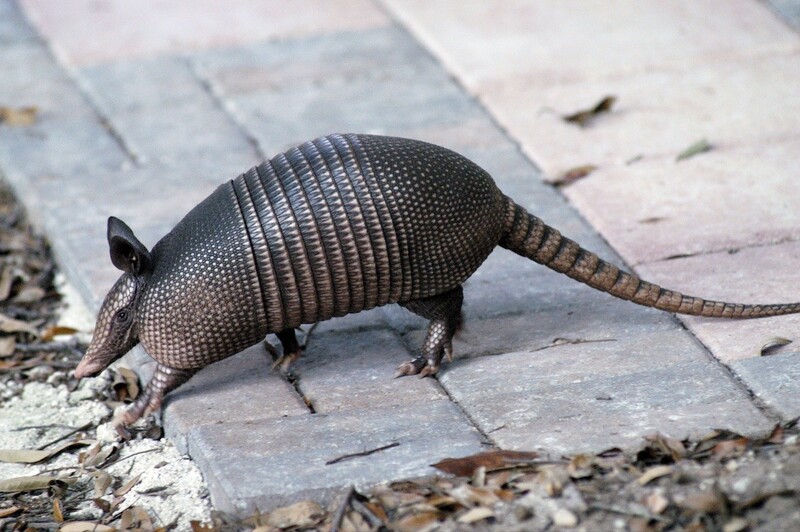 Once tuned in to target armadillos, these units will keep them out of the protected zone established by setting them out in strategic locations around the home. Each unit can protect up to 5000 sq/ft for armadillo and can be powered by using 4 “C” cell batteries. Our machines feature several features making them ideal for repelling armadillo. First, they have a wireless remote so you can turn them on/off as needed. Second, they can be set to go off only at night which is when armadillo are most active. Third, they use a flashing LED light bar which armadillo can actually see. In general, they do not see well but this piercing light will be noticed by them which they are not used to seeing and this strobe effect will scare them as well as the audible sound they will hear. The best armadillo settings are to set Operating Time to “night”, the Ultrasonic slide button to “Motion Sensor”, the Motion Sensor Sensitivity to “30” and the Sonic Volume to “60-80”. The frequency (yellow knob) should be set almost all the way to the left. Plan on powering the unit with batteries and placing them where they will point to routes of entry or where they are digging in the yard. Another passive approach to armadillo involves taking away their food supply. Although armadillos will readily feed on plants, they prefer grubs and other insects common to any lawn, flower bed or mulch pile. Treat these insects using a fast acting granule and liquid and often times this will force the armadillo to forage elsewhere or risk starvation. In general, grubs are a favorite food of armadillo. And in the fall and winter months, grubs will be active up close to the surface of the turf. They’re also peaking size wise which means they will making enough noise to attract predators like armadillo. For this reason, treating the turf with a combination of granules and liquid will many times yield fast results. But the key is to use the right actives. For this job, DEMAND GRANULES have proven to be the best option. Apply 3 lbs per 1,000 sq/ft and in most cases, one treatment will do the job. 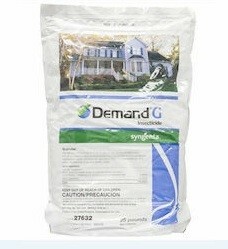 Demand uses a fast acting ingredient so it will work on insects within a week or two. But this same active also acts as a repellent to digging armadillo. This happens because the main ingredient inside the Demand granule is irritating to the mouth, nose and eyes of any animal that digs into treated turf. Foraging animals will readily stick their snout into the dirt and this behavior will cause them to contact the granules which in turn will cause them some discomfort. This discomfort isn’t harmful but most any animal will be bothered enough to force them elsewhere. Use a regular fertilizer spreader to apply the Demand. 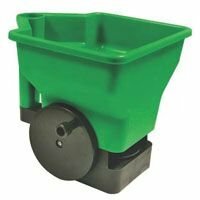 For flower beds or other small areas, a SCATTERBOX SPREADER will be best suited. After the granules are applied, spray over the top with CYONARA RTS. Water is needed to activate the granules and since they will take a week or so release their active into the soil, spraying with Cyonara will really help by insuring immediate penetration of active chemical. Use 1 quarts of Cyonara for every 16,000 sq/ft of turf and retreat twice. The second treatment should be 2 weeks after the first. Cyonara is odorless but uses the same active as Demand which means the liquid will also be irritating to digging animals. Although repellents and the treatment of turf are passive approaches used to manage an active armadillo problem, they will often times solve the problem. In most cases they will force the animal to find another food supply and in turn, leave your turf alone. But every now and then you will encounter an armadillo which is either too stubborn or too hungry who won’t leave and in turn, force you to pursue a more extreme measure of control. 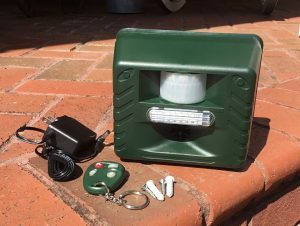 If the local armadillos are over populated and you want to employ a more direct line of control, the use of a live trap will provide quick results. Simply place the trap where the animal is digging. Bait with fresh fruit topped with LOGANBERRY PASTE. This lure is a blend of several fruits which armadillos cannot resist and will get their attention so they quickly find your offering. Nowif the animals have been digging in the yard and turf, use our GRUB BAIT. Since this lure smells and tastes like grubs, nuisance armadillo digging for this seasonal food won’t be able to resist. 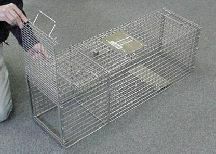 There are several traps which will work for armadillo control but you need to use at least 30″ long. This insures they won’t trigger the door closed before they get far enough inside to stay caught. We have several commercial grade models and the most popular they use is the LT111230. This trap will work well for a range of small to medium sized animals like opossum, feral cats, woodchucks, marmots and armadillo. It measures 11″ wide, 12″ tall and 30″ long. Made with galvanized steel and heavy gauge wiring, it will provide 10+ years of service. We also offer it with a sliding rear door for easy bait placement and animal release. See it here: LT111230RD. 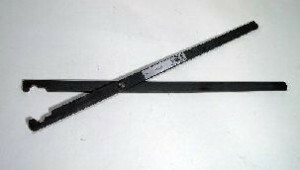 Now if you don’t have a need for such a commercial trap, our LT101232 is lighter in weight due to the less bulky gauge wire and frame components used to build them. Made for consumers, this trap will provide 5+ years of service. Another trap you might consider using iIf you have a den or hole through which armadillo are traveling is the LT111236BD. It’s easy to set, doesn’t need bait to work and works great for any ground nesting animal like armadillo, woodchucks, prairie dogs, etc. It features a unique front door panel which can be removed so the trap can work like any conventional design. But if you can place the trap over a den hole, you can put the front sliding door in place and force the animal in the den to enter the trap and then forage back to the trip pan which will close the door so they can’t escape. For this trap to work, you simply need to place it where the animal is active. This is usually in the yard where they are digging or around a den you know is active. The last option for controlling nuisance armadillo is to employ a kill trap. These traps work quickly and are highly effective for any animal including woodchuck, marmot, beaver, opossum, raccoon, armadillo and more. These traps are made with heavy gauge cold rolled steel which will last for many years. The springs are designed to be set over and over so they require very little maintenance and will work in most any weather environment. The real key for making good sets for armadillo is place the trap where they must pass. So if you have a wide open area in the yard where they’re digging, you can surround it with 2×6’s or 2×8’s. They should be set on their side and held up with some spikes or stakes if needed. Set them in a diamond pattern with two entries at either side. Armadillo returning to feed will circle the wood and try to enter where they see the ports and if you’ve set 220 BODYGRIP TRAPS. a these openings, they’ll get trapped every time. Sets can also be made at fence openings, under hedges where pathways are clearly visible or over an active den hole. 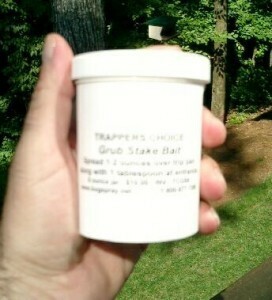 Commonly used by professional trappers, these traps are highly effective when proper sets are made. Death is quick and rarely do they miss. Be sure to view some of our videos on how to set them, how to handle them and what to avoid so you don’t injure non-target animals. Since armadillo will be traveling on the ground, you’ll need to use BODYGRIP TRAP STANDS to get the trap up where it needs to be. These will keep the trap steady and secure. The 220 has 7″ square opening and in general, is plenty wide enough for any armadillo but we do offer the BG280 and BG330. The 280 is 8.5 inches wide square and the 330 is a full 10″ square. 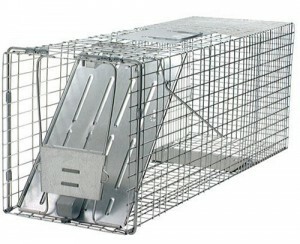 In general, these traps are too large and could allow armadillo to pass through so we suggest you start with the 220’s and add a larger size later once you confirm the 220 isn’t quite big enough. Lastly, the springs on these traps are hard to compress using your hands so a BODYGRIP TRAP SETTER is strongly recommended and well worth the investment. 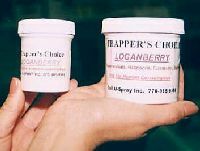 You should also use some LOGANBERRY PASTE or GRUB BAIT listed above to ensure they come right at the trap. Just found this site. Brought it to my desktop. Very informative, very well written, overwhelmingly projects a sense of expertise. Armadillos devastated our complete yard, and I had about come to end of my rope when I discovered this site in 2013 or 2014 and purchased two of the bodygrip traps and a setting tool. Killed two armadillos the first night after receiving and setting the traps. Have purchased 4 more, and keep them set in all the satellite holes. Have killed over 125 of these destructive creatures in a yr and a half! Neighborhood turkey vultures love their regular treat! Came hope from a 3 day trip recently and an armadillo had met his demise in our absence and the buzzards were feasting on our yard. There must be thousands of these creatures in Florida.